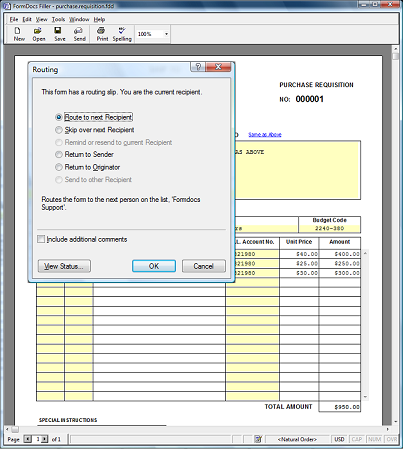 FormDocs Forms Routing lets you easily create simple but effective workflow procedures without the typical expense and administration of dedicated workflow products. For example, two or more FormDocs users can review, edit, and digitally sign (approve) a form by exchanging it among themselves in a serial fashion (i.e. one after the other). FormDocs routes a form using shared folders, e-mail notifications, and automatically manages the routing process according to an ordered list of recipients you specify in a routing slip. 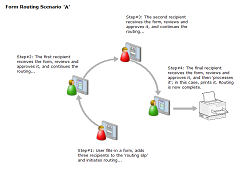 Routing slip recipients can be specified with regular e-mail addresses such as 'joe@company.com', or as nicknames such as 'Joe Smith', or as role titles such as 'Manager'. 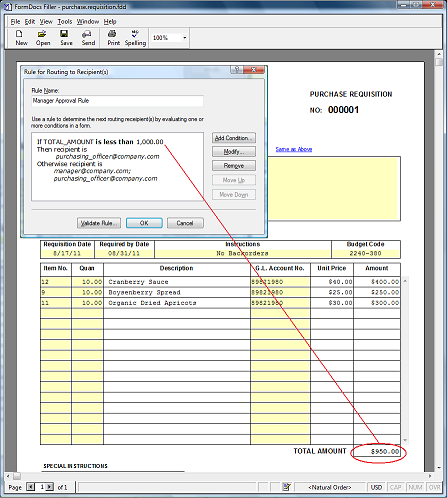 Recipients can be selected directly from global address books or the local address books of e-mail applications. You can also specify conditional recipients using 'routing rules' you create, to implement your organization's processes and policies. For example, a policy might allow employees to submit a purchase requisition directly to the purchasing officer when the amount is less than one thousand dollars, but when the amount is over one thousand dollars they must first obtain their manager's approval before it is submitted to the purchasing officer. A FormDocs routing rule can automatically determine and correctly handle either situation by examining values in one or more form fields. 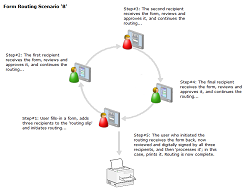 FormDocs forms routing also handles exception conditions and recipient tracking. Note: All routing recipients must have FormDocs Filler and a 'Microsoft MAPI-compatible' e-mail application in order to participate in FormDocs routing. Popular examples are Microsoft Outlook, Microsoft Outlook Express, Windows Mail, Lotus Notes.